18 works by the only Australian official war artist to directly capture horrific scenes of the Holocaust in Germany went on display at the Australian War Memorial in Canberra. Aged 98, Alan Moore is one of only two living official war artists from the Second World War. “These works are a unique opportunity for visitors to see the perspective of a single artist working across the Pacific and European theatres of the Second World War,” said Dr Brendan Nelson, Director, Australian War Memorial. This small display, in the Memorial’s Second World War gallery, brings together 18 paintings and drawings, including two Holocaust scenes painted in-situ as Moore witnessed the liberation of the Bergen-Belsen concentration camp in Germany. 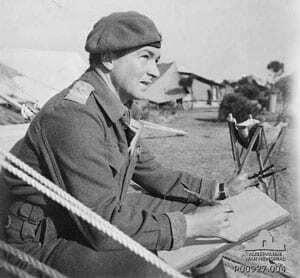 Alan Moore began his commission as an official war artist on New Year’s Day 1944, capturing RAAF activities in the Pacific. In March that year he came under Japanese fire while documenting the Allies’ campaign to regain control of the Admiralty Islands off New Guinea. Following his deployment in the Pacific, Moore travelled to Europe in mid-1944. During a bitter Italian winter, he painted the Nos. 450 and 454, RAAF, squadrons as they faced a hostile enemy, and in London he witnessed sombre scenes of returning prisoners of war and the suffering caused by German air attacks on the civilian population. 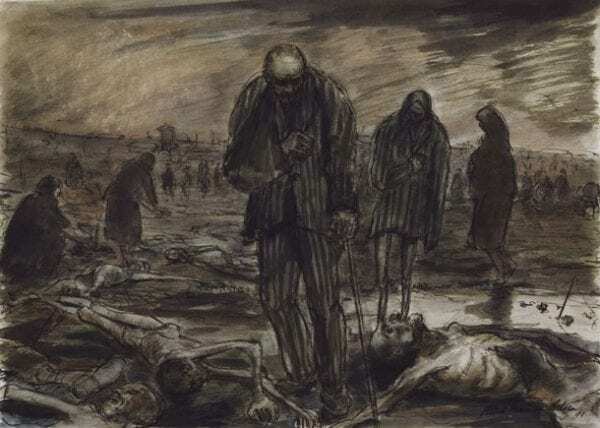 In April 1945, as the war in Europe drew to its end, he documented the liberation of the Bergen-Belsen concentration camp in unflinching drawings, paintings and photographs that capture the tragedy and horror of the Holocaust. 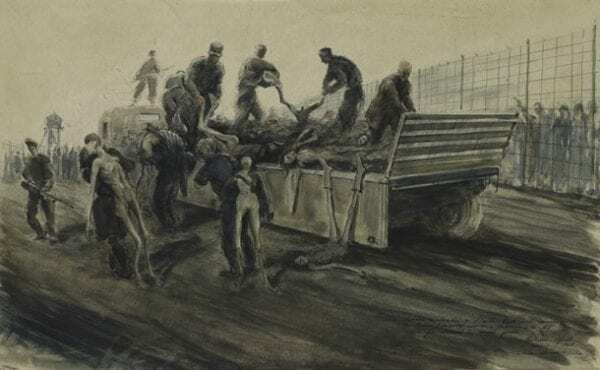 In two drawings completed at Belsen, Moore depicts a blind man moving slowly through a devastated landscape strewn with emaciated corpses and a brutal scene of former SS guards unloading bodies for burial in mass graves. When a British soldier suggested people would not believe the extent of the atrocities Moore depicted, the artist began taking black-and-white photographs with his camera.